Hi all, I’m back from a trip to Northern Illinois yesterday to experience a day at dog camp. I live Northwest of Milwaukee and initially thought it would be a bit of a haul to camp, but the drive was easy and camp wasn’t hard to find. As I drove up the gravel road to Camp Dogwood, I had no idea of what I’d encounter. I have no experience with dog camps and only was to human camp once as a child. So, I was impressed by the tidy white and green buildings set into wooded areas around a central field. The agenda for the day was full of diverse activities, Flyball, Pet Massage, Photo Workshop, Agility, various Training sessions and, with the day being hot and sunny, lots beach time. I stopped in at a Training session, first, hoping to pick up some tips. This session involved work in walking comfortably with a dog, turning, returning, remaining calm when when encountering the unexpected and a valuable Catch Me excercise. The dogs in class represented a wide array of breeds and sizes. There was something for everyone. Next, on to the beach, one of my favorite places. As you might expect, the Spring session of Camp Dogwood, usually conducted in late May, can bring a variety of weather. My day at camp was hot and sunny and the furry creatures needed some cooling off after camp actitivies. 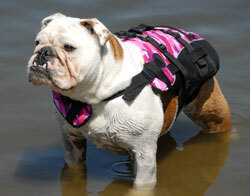 Surprisingly, all breeds enjoyed the beach, even those that are not traditional swimming breeds. dish up an idea of a fun beach game for a dog other than fetch and I was amazed at the lineup of treat-catching, musical hoola hoops and sunglass competitions that were in store. With all the activities available, I had come to camp wondering if this would be a conveyor-belt type of experience with campers expected to participate from event to event. Not so. All activities were completely optional. 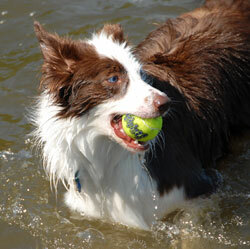 Campers could pick and choose depending on the energy level of themselves and their dog. We all need a chance to relax and rest up. Many of the campers I spoke with are return visitors to Camp Dogwood. Some of them have signed up for camp 10 and 12 times. The repeat campers say that they love all of the Camp Dogwood seasons, but that Winter is their favorite. They described the intimacy of the camp during that season and the fun of getting outside in the snow. Ah well, all great parties end sometime and I had to take my leave of Camp Dogwood all too soon. I know that the fun continued without me…..arts and crafts involving mosaic waterbowls, herding, campfires. Friendly humans and fabulous dogs. I wished I could stay on. Thanks to all at Camp Dogwood for a terrific day at camp! The Humane Society of Waupaca County, John and Rose Poris, and a little dog named Carrie Anna have a lot to celebrate! Carrie Anna was the 500th dog adopted from the HSWC Adoption Center. Mr. and Mrs. Poris took Carrie Anna and a large batch of prizes home last week. HSWC has a great selection of dogs up for adoption right now, including some puppies, and about 50 cats! Check out the website at www.waupacahumane.org or call 715 258 2545 for more information. The Wisconsin Humane Society is thrilled to announce Feasting for Fido 2010. This fun evening will include restaurant tastings of creative cuisine, inspiring wines, locally-crafted beer, festive music, an auction and raffle prizes. The Wisconsin Humane Society works diligently to provide expert animal care and adoption services in the Milwaukee area. In 2009, we found loving homes for over 10,000 homeless animals. Help us continue our goal of saving lives by celebrating with animal lovers at this terrific event. Tickets are only $45 if you register in advance at www.wihumane.org. No paper tickets will be mailed; you just need to check-in upon arrival. When: Thursday, July 15, 5:30 p.m. – 8:30 p.m.
Why: Dine, mingle, drink, socialize with your favorite four-legged and two-legged friends (please leave your dogs at home; you can meet animals from WHS, though!) knowing that you’re also doing a good deed by helping homeless and injured animals get a second chance at happiness. The SPA Department at End of the Leash, LLC is working with the national non-profit group A Matter Of Trust to assist in the gulf oil spill clean-up. Their groomers are saving dog hair which will be sent to aid in the gulf oil spill clean-up. The hair will be stuffed into nylon stockings which are tied together to make “booms” that surround and contain as well as soak up oil spills. Some of the hair is also sent off to nonwoven needlepunch factories to make batches of hairmats. These mats are for emergency oil spills and for oiled bird and mammal cages. Patti Muraczewski, owner of For Pet’s Sake in Mukwonago, has offered to store the hair until the next shipment can be sent. Fundraising jars have been set up at End of the Leash, For Pet’s Sake and Puppy Love Dog Grooming in East Troy to collect money to pay for the shipping costs. End of the Leash, WISN Alist Best Pet Supply Store winner for 3 years in a row, has been providing the best in pet supplies, holistic & all-natural food and treats to Mukwonago and surrounding area residents for four years. They also offer full grooming services seven days per week using all natural products in a relaxing, nurturing environment. 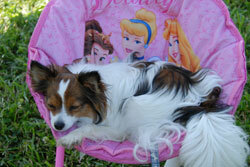 The mission and passion of End of the Leash is to help pets live a long, healthy and happy life. Dogs sometimes have jobs, too! 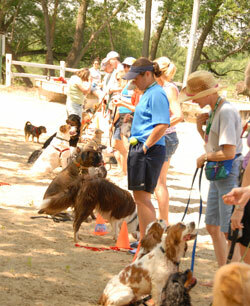 Visit with area dogs who spend their days at work helping us at our Working Dogs Day between 11:00 am and 3:30 pm. Explore the Nature of Dogs special exhibit. Showcase your animal best friends by having their portraits taken by local photographer, Nancy Greifenhagen. Bring pet food and supplies to donate to HAWS. Event is free with museum admission. YOUR best pet companion is also welcome!!!! SCHEDULED TO APPEAR: K-9 Police Team, Therapy Dogs Inc., Search & Rescue Canines, E.A.R.S. Animal Rescue reps., Waukesha County Humane Officers. There will be two (2) Costume Contests, one for store bought costumes and one for hand-made costumes. Port Washington, WI – Lakeshore Veterinary Specialists and Emergency Hospital is hosting its 2nd Annual Public Open House & Dog Walk on Saturday, June 19th from 9 am to 3 pm. Lakeshore Veterinary Specialists is located just off I-43 (exit #100) in the North Port Shopping Center at 207 W. Seven Hills Road in Port Washington. Proceeds of the event will benefit the Humane Society. The event begins with a dog walk through the neighborhood. After the walk, enjoy food, beverages, pet assessments, information on pet care, hospital tours, and more. – Free Orthopedic Assessments – $50 value! Lakeshore Veterinary Specialists and Emergency Hospital has state-of-the-art facilities in Port Washington and Racine to help service each patient’s needs in a compassionate and comprehensive fashion. Lakeshore offers emergency and critical care services as well as board-certified surgery, internal medicine, and dermatology. We are available 24/7 to meet any of your pet’s needs.